Cy Sadaka seafood chef, legend and hospitality industry expert in the city of Chicago, started his career 45 years ago in the restaurant industry as a waiter at the popular Chinese restaurant, Abacus. Sadaka became a lead chef in a matter of time and within three months, the owner offered him the position of ‘Restaurant Manager.’ This sparked his interest in attending culinary school in Chicago to further his passion for food with a specialty in seafood! Sadaka has traveled around the globe learning about seafood and the different ways it is served in regions across the world. This led Sadaka to launch his own restaurant, King Crab Chicago at the original location, 1816 North Halsted in the heart of Lincoln Park 37 years ago. Throughout Sadaka’s lifetime he has developed and managed several restaurants, including: Cy’s Steak and Seafood, Cy’s Chop House, Cy’s Ale House, and Cy's Crab House on Ashland and Wheeling, Illinois. Currently, at his main restaurant King Crab Chicago on Willow and Halsted, he continues to serve some of the best crab and fresh catch in the city. King Crab Chicago also has a full-bar and tastiest bar appetizers. A visit to King Crab would not be complete without a taste of Cy’s signature cocktail, the Mai Tai. Make sure to come visit Cy at 1816 N. Halsted where he serves his customers every day of the week, Monday through Sunday — and if you’re lucky he might even help you crack open your snow crab legs! Chesapeake Oysters - .75 cents ea. Shrimp - .75 cents ea. King Crab Chicago is hiring! We are seeking experienced servers and bartenders. We are also hiring 1 cook and 1 prep cook at this time as well. We prefer you to please apply in person with a copy of your resume: Monday-Saturday after 3pm. Please ask to speak to Mitra, or feel free to send an email to cysadaka@yahoo.com. 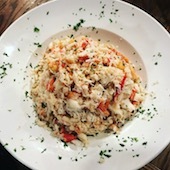 A stunning display of mounds of freshly harvested crab meat from King Size Jumbo Crab Legs (Cy is one of the ONLY chef's in Chicago to get "Jumbo King Crab") with a blend of special seasonings. This is a MUST try! The Mai Tai is a cocktail based on rum, Curaçao liqueur, orgeat syrup, and lime juice, associated with Polynesian-style settings. "Maita'i" is the Tahitian word for "good"; but the drink is spelled as two words, sometimes hyphenated or capitalized. 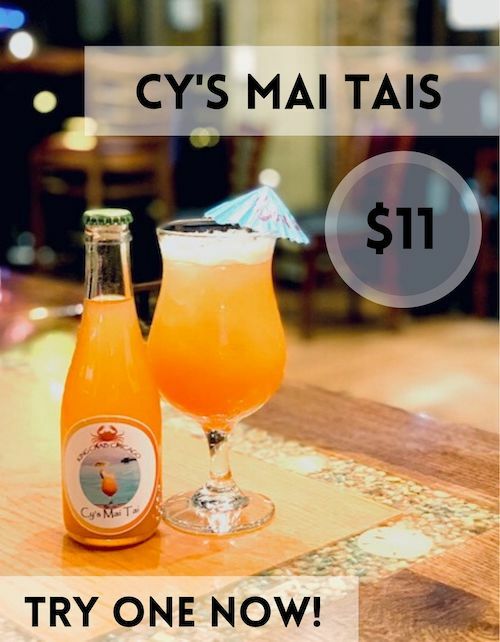 Cy's Mai Tai is unlike any other Mai Tai - prepare for the most refreshing taste you will ever experience in your mouth! 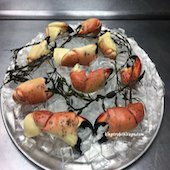 The Florida stone crab is a crab found in the western North Atlantic, from Connecticut to Belize, including Texas, the Gulf of Mexico, Cuba, The Bahamas, and the East Coast. Blended with Cy's superior mild mustard dipping sauce with special blended seasonings, this is one of the most unforgettable blends of seafood you will NEVER FORGET - it simply melts in your mouth and has an indescribable taste. If this isn't your new favorite dish, it's on US!